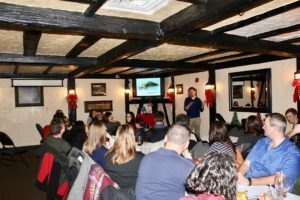 Join us to kick off the New Year at our next Southern Ontario Pub Night on Tuesday, January 23rd 2018 in Burlington. Title: Mercury and other contaminants in aquatic food webs: does context matter? 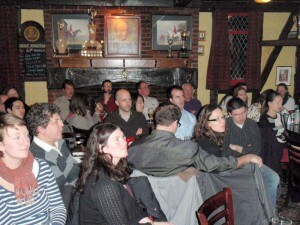 Join us for an engaging talk, good eats and fine brew at the next Ottawa Pub Night. Jessica Veligogna and Ajith Samarajeewa will discuss their research on the effects of metal and metal oxide nanomaterials on soil organisms. Socializing, food and drink orders begin at 5:00 pm, the talk begins at 6:00 pm. Get there early for discounted appetizers (available until 6:00 pm). When: Wednesday January 31 from 5:00 to 7:00 p.m.
On Wednesday, February 21, 2018, Laurentian SETAC is hosting a special event to mark the International Women and Girls in Science Day. Join us for an exciting panel discussion on equity in science, moderated by Dr. Yamini Gopalapillai. 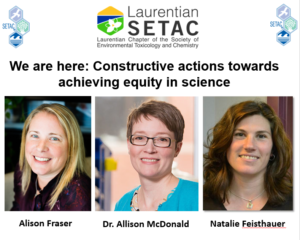 Our guest speakers are Alison Fraser, Dr. Allison McDonald and Natalie Feisthauer. When: Wednesday February 21st 2018, 6:30-8:30 pm; Doors open at 6:00 p.m.
For more details and for the panelist biographies, please see attached poster. 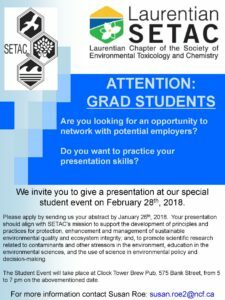 The Laurentian Chapter of the Society of Environmental Chemistry and Toxciology (Laurentian SETAC) is inviting current and recent graduate students to present their research to our audience of academics, government and private science professionals at the Ottawa Pub Night on February 28th, 2018. This is a great opportunity for new graduate students to seek early feedback on their projects and to gain communication skills, and for more senior students to practice their defense. Our student night is a great networking event for all. Please share and post the attached information with faculties, staff and students who may be interested in participating this event as student or as a judge. Abstracts are due January 26th, 2018. We are pleased to announce that we will be hosting a Greater Toronto Area (GTA) pub night on Tuesday March 27th! 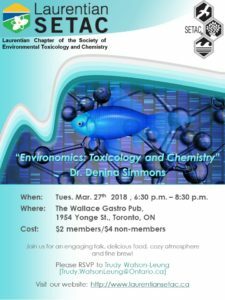 Join us for an engaging talk, delicious food, cozy atmosphere, and fine brew at The Wallace Gastro Pub in Toronto. 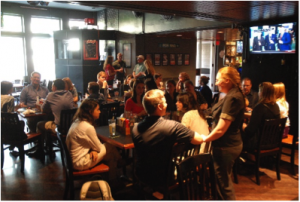 Join us for an engaging talk, good eats and fine brew at the next Ottawa Pub Night. Leana Van der Vliet will give us a behind the scenes view of how standardized test methods are developed using the amphibian test method as an example. Socializing, food and drink orders begin at 5:00 pm, the talk begins at 6:00 pm. Get there early for discounted appetizers (available until 6:00 pm). 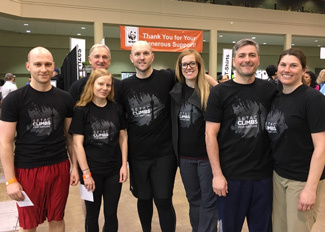 When: Wednesday March 28 from 5:00 to 7:00 p.m.
What: Climb CN Tower (1,776 steps!) to raise money for WWF conservation projects. Who: Friend & family welcome! Join us for our last pub night of the Winter/Spring 2018 season! Alison Fraser and Mary-Kate Craig from Shared Value Solutions will discuss, through the use of case studies, the role of Indigenous Knowledge and Western Science in the assessment and management of environmental issues. Socializing, food and drink orders begin at ~6:30 pm, the talk begins at ~7:00 pm. When: Wednesday April 18th from 6:30 to 8:30 p.m.
Join us in greening up the planet this year’s Rotary Tree Planting & Earth Day Event on April 21st, 2018 at Guelph Lake. 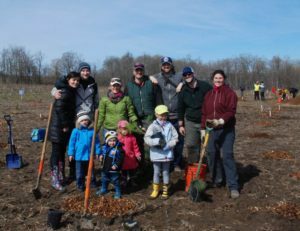 The Rotary Club of Guelph has pledges each year to purchase 5000 trees and organize a one-day tree-planting blitz at Guelph Lake with the long-range goal of returning 100 acres to forest cover by the year 2020. For the last few years Laurentian SETAC members have participated in “The Tree Canopy Challenge” to helped the community by planting trees. This year, year 11, we will take the opportunity to fill in areas where we have had less than satisfactory survival rates, mainly caused by dry weather conditions during the summer following our planting day. Please see the flyer for more information and/or if you are interested in participating RSVP directly to Gerald Tetreault (gerald.tetreault@canada.ca).